Guatesat 1 is Guatemala's first satellite. The 1U CubeSat is being built at the Universidad del Valle de Guatemala (UVG). The mission is to evaluate and integrate the different systems that make up a CubeSat to develop in Guatemala the skills required for the operation of satellites, while remote sensing elements are validated, e.g. for monitoring cyanobacteria in Lake Atitlan, in future satellites. A monochromatic camera, alongside a rotating mechanism that holds and changes between four optical filters, will be used to test the remote sensing capabilities of the satellite. After deployment, to meet minimum success criteria objectives, the satellite will have to stabilize itself using its passive ADCS, deploy its COTS antenna using the in-house deployment mechanism, collect power through eleven solar cells and charge its two lithium-ion batteries, send health data using the COTS communications module, and receive and process data packages from ground using the COTS OBC. Significant success criteria objectives include capturing images at one wavelength using the COTS monochromatic sensor and one optical filter, sending images back to ground, and changing the position of the carousel that holds the optical filters. The Japan Aerospace Exploration Agency (JAXA) and the United Nations Office for Outer Space Affairs (UNOOSA) have selected Guatesat 1 for the second round of the UNOOSA-JAXA KiboCUBE programme. 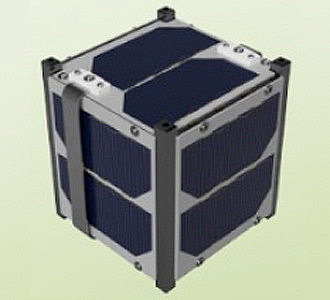 KiboCUBE is an initiative that offers educational and research institutions from developing countries the opportunity to deploy cube satellites (CubeSats) from the Kibo module of the International Space Station. Guatesat 1 - 2019 with ?